The Positive: QE continues to work unless fundamentals dramatically improve. This of course included the assumption that QE would continue unabated. The Negative: EU contagion anxiety remains in hibernation. Below we look at these and other forces likely to dominate markets this week. Events of the past weeks have borne out the importance of QE. Clearly markets believe that given the continued weak global economic growth and earnings picture, the continued liquidity drip and low bond rates was what held risk asset prices aloft. The unquestioned top market driver of recent weeks was the Federal Reserve’s plan to begin reducing its QE program. So much has already been written that it’s easy to lose sight of what it really means and what it doesn’t. The Fed wanted to tell us rates are rising the only question is how much more and how quickly. 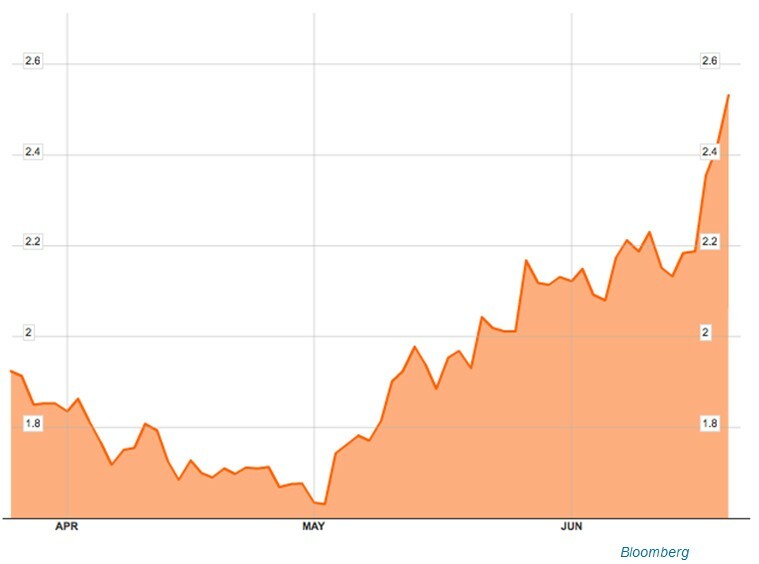 Since early May, when rumors of the taper first began leaking out, bond yields began rising. Since last week’s fed action, many have spiked. For example, look how the yield on US 10 year notes went vertical after the June Fed minutes and comments. The expectation was that the Fed would try to calm markets, but they got a shock when Bernanke specifically indicated that the fed intended to wind down QE far faster than expected, saying that If (and this is a big if, as discussed below) the US economy continues its slow but steady expansion, the fed intends to start reducing QE later this year and exit by mid-2014. He offered a clear time table – a QE exit by mid-2014. Obviously he’s not going to remove QE all at once, so the implication is that in order to start reducing the $85 bln in bond purchases slowly, he’ll be starting at some point in the coming months. September seems to be the consensus starting point. Sounded optimistic the economy to the point that he even revised his unemployment figures downward, closer to the Evans rule 6.5% goal needed to achieve for ending QE completely. He said downside risks had lessened and that he was not worried about the recent spike in interest rates. What’s Unclear: Bond, Stock Selloff Justified? The Fed’s stated forecasts prove too optimistic and cause the Fed to change course. The Fed has shown it’s nothing if not flexible. Remember that just 8 weeks ago the consensus was that there was no end in sight for QE or low rates. Remember also that Bernanke has long expressed the fear of prematurely ending stimulus programs, and that his likely successor, Janet Yellin, is believed to share his views about preferring to err on the side of extending QE, especially while inflation remains quiet. The Fed’s main goal at this stage is to dampen some of the speculative fervor in markets and/or at least start easing expectations about fed easing. Unless benchmark rates continue rising, yield seeking cash will still have few alternatives to stocks. We’re not the only ones who suspect that the spike in rates and fear has again become overdone. See here for details JPM’s rosy view of a coming continued benign environment for stocks. We’re not ready to call the current situation a buying opportunity, however we have been slowly adding to positions in income stocks with 6-9% sustainable and growing yields, as some have already seen over 10% -15% corrections and we’re comfortable sitting with those yields. Those who follow our tweets know we’ve been watching the LINN energy story closely. The combination of an ongoing bear attack and overall market pullback has made this elite upstream (and thus yes, more commodity risk) MLP particularly interesting. We’re working on a very simple income hedge for it. Stay tuned for more on that, and also our updated H2 2013 forecast. 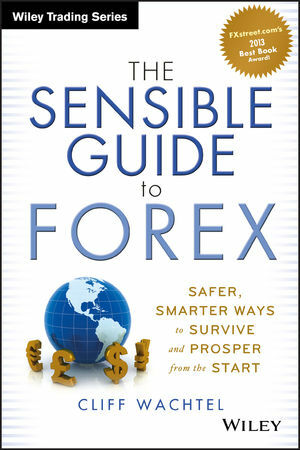 It also means that markets will continue moving with every utterance that is believed to be authoritative about Fed intentions, be it from FOMC members or well sourced journalists like John Hilsenrath, as well as with data points that are believed to influence fed thinking about the pace and extent of tapering. While the overall calendar is light this week, Tuesday and Thursday have enough potential market moving US data to merit investor attention. For the past two weeks overnight SHIBOR (Shanghai Interbank Offered Rate) rates – China’s version of LIBOR, having been moving higher, and it soared to a record high of 13.44% Thursday, up from 7.66% the previous day. Thanks to liquidity injections by China’s central bank on Friday, the rate fell to 8.492%. While this is still more than double last month’s rate, it was a relief for the markets in China and abroad because it indicated that the PBoC is no longer punishing speculators by holding the market hostage. However it is sending a message that banks and speculators cannot expect it to provide the same levels of liquidity in the past and that lending standards need to improve. There are no major scheduled Chinese reports next week, but keep alert for further SHIBOR volatility. The combined force of US and China tightening, along with the slowdown in China and its demand for commodities, undermined the primary demand drivers for EM stocks and bonds. It threatened their yield advantage and their export based economies, especially those based on Chinese commodity demand. EM bonds in general will lose their rate advantage as safer, developed world bond rates rise. Not just the bonds of EM commodity exporters, but also those of other EM nations like Hungary and Turkey are also getting hit. Last week we saw a number of signs of rising EU crisis risk. As with every early summer since 2010, we may again have renewed anxiety on Greece. EZ central banks have refused to roll over 3.7 bln in Greek bonds, and the IMF is unwilling to pony up additional cash until the EU does likewise to make up the shortfall. Meanwhile, Greece’s ruling coalition is looking unstable, adding additional uncertainty. The problem this time around is, Angela Merkel has a fall election coming and cannot afford to be seen as risking tossing yet more German taxpayer money down a Greek rat hole. Finance ministers in Luxembourg attempted last week to resolve one of the most difficult questions of Europe’s banking crisis – how to distribute losses from failed banks without sowing panic or burdening taxpayers. See here for details. The risk that lenders could get stuck with losses has not surprisingly lead to a completely predictable problem as a result. Euro zone banks are refusing to lend to banks in other parts of the EZ, suggesting declining confidence since the Cyprus bailout earlier this year. See here for details. The only major asset that was an immediate beneficiary of the tapering news (other than short positions in interest rate sensitive assets) was the USD. With virtually every major central bank either leaning towards further easing (BOJ, BOE, ECB, and RBA) or holding steady, the Fed is now without doubt the most hawkish of the lot, and that should reinforce the USD’s overall uptrend against its major counterparts. It has already begun the next leg down for the EURUSD, which is already feeling pressure given the above noted tensions in the EU. We view the likely USD strength in the coming months as an opportunity to buy quality non-USD assets linked to or denominated in currencies that have been in an uptrend for decades against the USD and are likely to continue to do so. See here for details on how the USD has lost value versus most other major currencies and hard assets, and here for ideas on simple, safe ways to cope with that trend going forward. There will be Fischer on Monday, Kocherlakota on Wednesday, Powell and Lockhart on Thursday, Lacker, Williams and Pianalto on Friday. Note however, that only Jerome Powell, as one of the board of Governors, is a voting member of the FOMC. Japan: National consumer price index for May, provides the latest check on Japan’s progress in raising inflation. 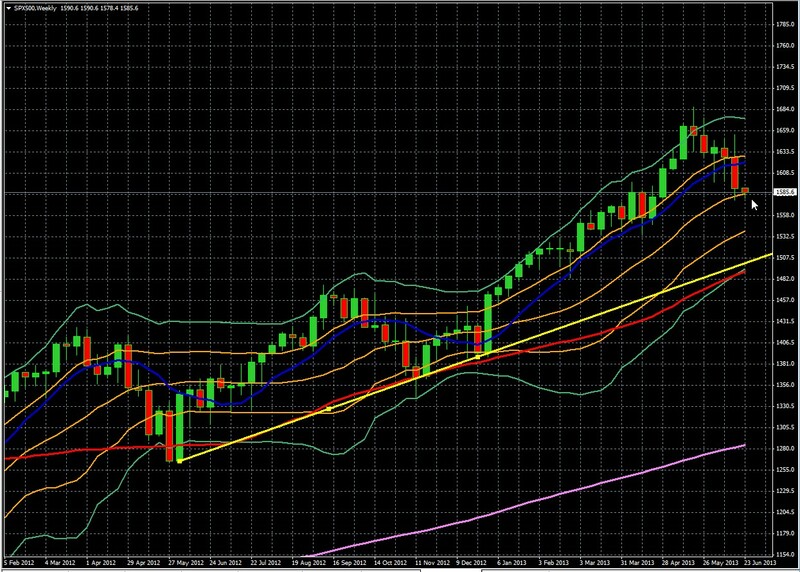 The weekly S&P 500 remains firmly in long term uptrends on the weekly charts. The 20 (blue) 50 (red) and 200 (violet) day simple moving averages (SMAs) continue higher. The index is still about 5% above its long term uptrend line (yellow). Warning: Last week it did exit its upper Bollinger band buy zone (bounded by the upper green and orange Bollinger bands, indicating we’ve lost upward momentum. See here for a brief review of how to interpret double Bollinger bands. As we can see on the chart, the last two times that happened the index tested support down to around its 50 day SMA and near the lower quadrant of the double Bollinger bands. That suggests we’re likely to see about another 5% pullback to around 1500. Many quality interest rate sensitive and dividend stocks have seen bigger hits than the overall S&P, and so might see deeper pullbacks. So far we’ve had about a 6% pullback, and are looking at roughly that amount again. So we’ll consider some further buys if they fall by a similar percentage. Despite the drama and headlines, the S&P uptrend is merely dented. The pullback has been minor, though it’s been much more pronounced in stocks perceived as interest sensitive, such as REITS and MLPs, which are not only higher yielding but also more dependent on debt issuance than other stocks to fund expansion. Thus if risk sentiment recovers next week, longer term technical momentum will not be a major obstacle. Other leading global indexes have shown similar behavior. Their uptrends are bent, not broken. ← Market Movers Week of June 9 2013: Weak Growth Vs.The Hilsenrath Omen?